The final day of the festival and the weather look a little better, although we were not holding our breathe! 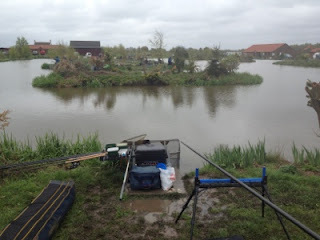 We would be fishing Bonsai Lake again for the final day of the Maggotdrowning Lindholme Festival. We would also be fishing from 10am until 4pm, so an hour earlier than the previous days. I drew peg 25 on Bonsai. The wind was definitely favourable and it was opposite the flyers, pegs 69 & 70. I also had a peg either side of me empty, giving me plenty of scope for the island ahead. My plan was around a single method for the day and that would be the method feeder. I did set up 13 metre and margin pole line just in case. I'd had a chat with Chris Walker the previous night around feeding patterns he had discovered during the week and the need for swim rotation. My plan was centred around this information. I cupped out on the 13 metre pole line and then prepared my method feeder. The weather didn’t look promising again today. The gear is soaked from yesterday and it looked like today would be the same! We were fishing Oasis today. Oasis is a U shaped lake of uniform width, around 16 metres. The favourite pegs would be the 40’s and pegs 2 through 10. These pegs are were the wind blows in to. After the great weather the previous day, today would be totally different. On waking up, it was windy, cloudy and there had been some overnight rain. That would not be the last of the rain for the day! Steve May organises a match where the bait is supplied every year at Cudmore on the Arena lake. Arena is of course famous for the Fishomania final that is televised on Sky. 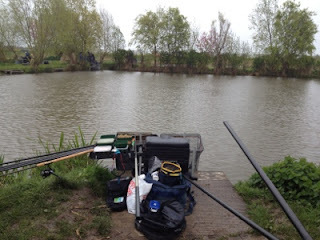 Arriving at the fishery around 8am I caught up with Colin (BNF), Jim (JimSpurs) and Paul (Animal). The rest of the usual suspects turned up and the banter started as per usual. The main question on everyones mind was what bait Steve May have chosen for us all. The match rules state that all competitors are to use the bait provided only, with no additives or colourings so it makes for a very even match. We all gathered outside in the rain and the usual disorderly queue formed. I pulled out Peg 1, which turned out to be one of the flyers and is to the right of the aerator. It's also the peg that Shane Atkin won Fishomania 2011 from. There was a total of 31 fishing today. Catching up with Paul and Mick from the Anglers Cabin forum we decided to have a session at Brafferton Fishery near York. Paul had fished there before, but Mick and I hadn't, so we would be looking for the tips and tricks from Paul. 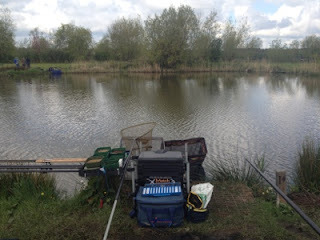 There are a number of lakes at Brafferton Fisheries, Match Lake, Ghost Lake, F1 Lake and Spring Lake. Paul had selected the Ghost Lake and we chose Pegs 15, 14 and 12. Paul advised that we would not need to fish beyond 11 or 13 metres, so I decided to have two swims at 11 metres (11 o'clock and 2 o'clock). I would also set up a margin swim towards peg 16 on my right. Rig choice was a Malman Thicko 4x16 to 0.14 line and a size 18 wide gap pellet hook from Drennan. I chose the heavier float as there was quite a breeze on the water and I wanted a stable presentation. I opted to start with White Hydroelastic and switch down to Blue if I was bumping too many fish. 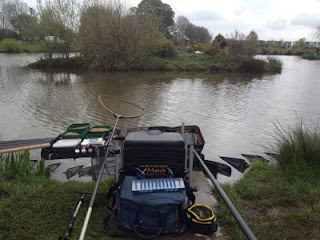 A match that was in the calendar for a while was a return to Phil Stone's fishery, How End. Phil shuts the fishery for the month of April but had kindly offered April's fools day to the Match Fishing Scene crew for another Champion Leagues match. I was definitely looking forward to seeing how the fish had grown since my visit last May. Arriving there were already a bunch of the lads waiting outside the gate and it wasn't long before Phil came round and welcomed us all in. The weather couldn't have contrasted the previous day any more... it was bright sunshine, not a cloud in the sky and very little wind. I of course was wearing my "Battered by BNF" shirt so the lads would know that I was beaten by Colin at Grange Farm, so of course the banter started as soon as I got out of the car. 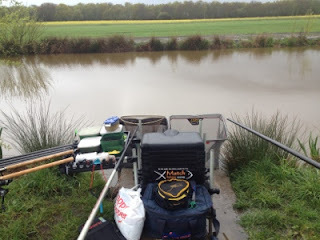 A forum post on MatchFishing Scene popped up looking for two more anglers for the belated Fur and Feather Champion League Match at Grange Park Fisheries in Messingham. A quick look at the diary, yep, free, I pay my monies and I'm on the match. It was a couple of days later when I rechecked my diary that I was going to have to leave London around 4:30am to get to Messingham in time for breakfast, that this weekend would be a 500 mile round trip for me and to help there has been mass panic at the petrol stations due to threatened strike action, perfect timing! I arrived at Grange Park Fisheries for breakfast and of course the banter was brilliant, especially as last time I was in this part of the world, even though I arrived with hours to spare I still missed out on breakfast as I was in the wrong place!